Review of Charlotte Bronte’s ‘Shirley’ | Romance Or Not Romance? I feel a strong sense of relief at having discovered Shirley. I consider myself a fan of Charlotte Bronte but have in the past abandoned her novel The Professor and found Villette hard-going (though ultimately rewarding). Shirley is certainly not ‘standard’ Charlotte Bronte. It reads a lot more like a George Eliot (or even Charles Dickens) novel, in being a work which is much more socially aware than Jane Eyre, with a larger cast of characters. In contrast with Jane Eyre, the book has a third person narrator, which brings it more in line with the standard model for the Nineteenth Century novel. Also significant is the fact that it’s her only novel to really transcend her abiding obsession with the lot of a female governess – although, latterly, a male tutor does become a significant character. But I found it refreshing to read heroines who were not as doom-laden and self-absorbed as Lucy Snowe (Villette). Whilst Caroline is a more sensitive character, more akin to what we expect from Bronte, the feisty Shirley herself defies our expectations and, for me, this was one of the greatest revelations of the novel. I found the first 100 pages (one-fifth) of the book rather arduous (although, it’s here that there is social scene-setting that is interestingly atypical of Bronte) but it’s necessary for what follows. 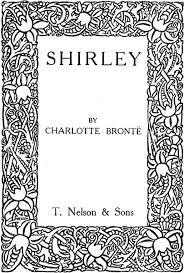 Whilst I acknowledge that Shirley is Bronte’s most ambitious novel in terms of providing a commentary on the society of early Nineteenth Century Britain, I found it most rewarding as the story of a love triangle and, when this strand of the plot develops later on in the book, I believe it becomes a much more compelling read. We also see in this storyline CB writing with emotional depth to challenge Jane Eyre. So it’s for this aspect of Shirley that I would recommend the book to any fan of CB’s writing. But I would also say that, if you’re a fan of the Nineteenth Century novel but not a fan of Jane Eyre, I would give Shirley a go – it shows a very different side to Charlotte Bronte’s writing. This entry was posted in Novel, Other writers' books, Reviews and tagged Bronte sisters, Reviews. Bookmark the permalink.